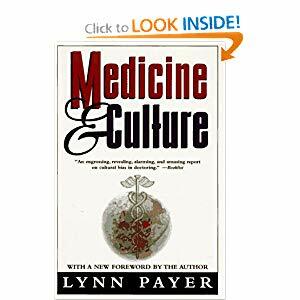 A number of years ago I read a book called Medicine and Culture, which was a comparison of medical practices and philosophies in Germany, France, England and the United States. Some conclusions, based on studies and statistics from the 1980s, were already outdated when I read the book. But it was a great read, and the analysis of medical philosophy was timeless. It was a fascinating read because it confirmed my observation (although not of England, having never lived there) that medicine -- by which I mean ways of defining and treating illness -- is totally different across these countries, even though they are all in the West, and two of them share a common language. For the most part doctors, who tend to be very sure of their medical training just chuckle when you mention what a doctor in different country told you. I have to mention my American friend Mollie - a pediatrician - as an exception here. She always finds the cultural differences fascinating and does not chuckle... she sometimes even looks worried. The most striking is not the doctors anyway, but the average person in the street. It seems like the average person in every country is absolutely certain that their information (data, studies, ideas) are right. Not just right: raw, unquestionable reality. My husband and his ex-wife gave birth to their first son in the U.S., moved to Germany and had another son, and then moved to France. As they tell it, it was just unbearable to deal with the differences in the totally divergent beliefs about medicine and children. Even negotiating two countries’ different beliefs is confusing. Last summer, while in the U.S., I mentioned giving aspirin to children (which is done in France) and my American friends fell all over themselves telling me about Reye's s syndrome, which I had never heard of, and how it is believed to be linked to aspirin given when a child also has a viral infection. You ask yourself, where is the truth? As the book I mention demonstrates, there isn’t any. The main message is that there are many very different paths to health and unhealth. In Clermont-Ferrand people laughed when they saw vitamins in my kitchen and noted how American they look. A number of French people I know have a complicated relationship with vitamin C, anyway. According to many, vitamin C causes énervement (agitation or over-excitement). So, people tell each other not to take it before taking an exam or doing anything that requires being calm or focused. Children are told not to drink orange juice before bedtime for this reason. Is this a medical fact? I did not spend a long time searching, but I have never found an agitation problem to be listed as a side effect of vitamin C in any accessible English-language discussion. The stereotype of Germans, which I have heard only in Europe, and not in the U.S. is that they dispense traditional medicine very sparingly compared to other countries, especially compared to countries of southern Europe. There is some evidence that this goes beyond cliché in that Germans are in general more open to homeopathic and other alternative approaches. Of course, sometimes this goes too far for me. A few years ago we were in Munich over New Years Eve, drank excellent beer with gusto and slept very few hours. In the morning I asked my friend Sabine for a painkiller because I had a headache and she handed some Tiger Balm to our friend Barny who then massaged it into my temples for a long time. That felt really great, but I still had a headache. I wanted actual aspirin. My strategy is to not get sick in Germany for fear of spending days with little white balls of sweet stuff under my tongue. Writing this reminds me that cross-national comparisons come unbidden and often unwanted, just because of the existence of accents. You ask a question, you have an accent, and right away it is seen as a cross-national comparison that is unfavorable to the current country. When I ask questions about some complex administrative issue in France, people always tell me right away that they are sure it is at least as bad if not worse in the U.S. It doesn’t help that I have never had the experience in question in the U.S. For instance, all of my children were born in France, so I can’t compare this experience to delivering one in the U.S., but still people think I represent the U.S. President (like, I am related to Bush?) or health and human services, or immigration services even though I have never personally had to immigrate to the U.S.
A very frequent cross-national comparison plays itself out in our family every time my step-sons, Théo and Alexandre, who live half-time with us, move back to our house. Their mother, from southern France, is a self-proclaimed frileuse, or someone who is very sensitive to the cold. If it is about 15 degrees C (60 degrees F), my little sons might be playing in the garden in tee shirts. Invariably (well, less and less these days) Théo and Alexandre come home after several weeks at their mother’s wearing down coats. The first glance out of the window always feels like a unreal experience of people being in two climates in the exact same geographical location. This tendency of Théo and Alex’s to bundle up decreased very rapidly when we moved to Madison, Wisconsin (USA) for a year in 2006-2007. There, suddenly, they were going to school in tee shirts in March or by April, in shorts. They claimed they were not as cold there, and I just laughed. Fine with me. Southern European women tell me all the time that I myself, or my children, are not wrapped up warmly enough. I used to be offended, but now I just say, well fortunately they are rarely sick, so all must be well anyway. The whole dealing with cold and dampness makes for hilarious other surreal images. I have been in downpours in the park in the summer in sweltering heat. My kids will be running through puddles and laughing in the rain while other people, including other children, stand under awnings feeling trapped and unable to go anywhere because, they tell me, getting wet will make them sick. After all of these years, my strategy is to try to ignore these disagreements and do the best I can. I ask for research when there seems to be good research. There is not reason to talk with other people about data or medical research. Even if you did, there has been so much controversy about the existing research. My favorite is the red wine story. Some years ago research was published that showed that red wine was good for your heart. It is always dangerous to report such findings because of course there is not a linear relationship between wine and health. Anyway, people in the U.S. ran out and bought lots of good wine to drink to everyone’s health. But then we learned that the research had a fatal flaw: the sample of people in the study who did not drink (and were in poorer health on average) included many former alcoholics. Somehow, the researchers did not think to ask about prior drinking behavior. So many cases of red wine were then stored in away until more recent research shows that a small amount (but of course not a large amount) of red wine is indeed good. Unless we hear now about another flaw in the research design ….